At the Pequest Trout Hatchery, flowing water is life! 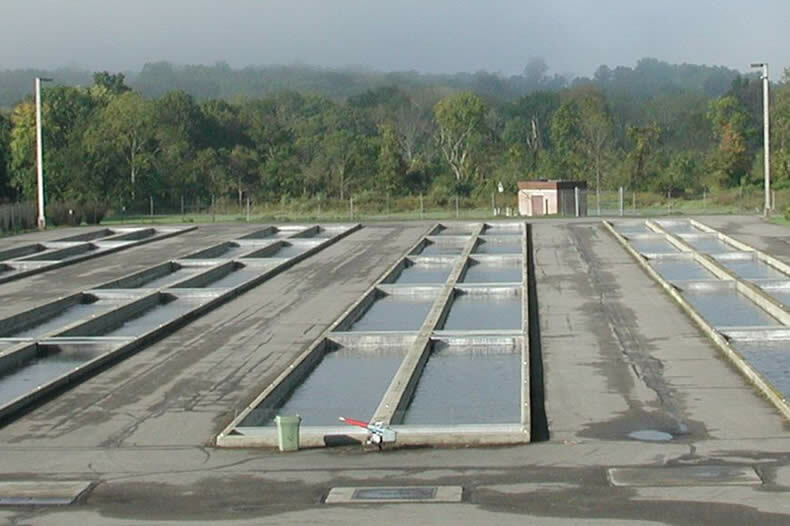 Clean, moving, cold water is essential to the success of a trout rearing facility. 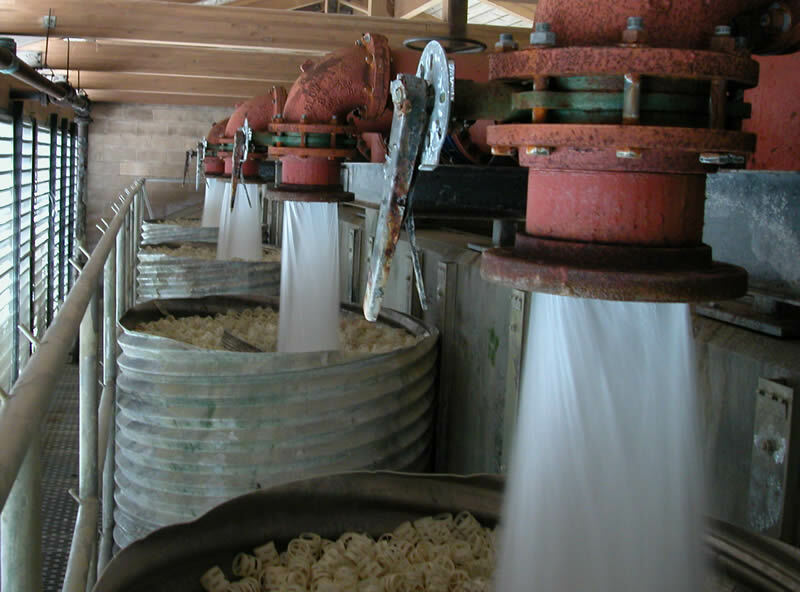 Six artesian wells provide the hatchery with up to seven thousand gallons of water per minute. Remaining at 52 degrees Fahrenheit year round, and capable of maintaining a continuous flow, the water supply is a critical factor in propagation and maintaining a trout production cycle. The hatchery sits in the Pequest River Valley over the Basin Aquifer/Valley and Ridge Sedimentary Units, a water-logged limestone formation. The topography serves as a huge natural funnel, channelling precipitation trapped between granite mountains on both sides to the valley floor, replenishing the aquifer. Water flows through the hatchery in the upper aerator building. 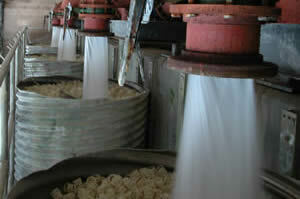 The hatchery's water flow begins with the six wells sunk deep into the aquifer. Powerful vertical turbine pumps, some as large as fifty horsepower, bring water to the surface. It then travels through large pipes to flow meters in the well houses. Measured in gallons per minute (GPM), the water is sent through an underground manifold, eventually arriving at the Upper Aerator Building. Here the water spills out and goes through tanks filled with "biorings" for aeration. 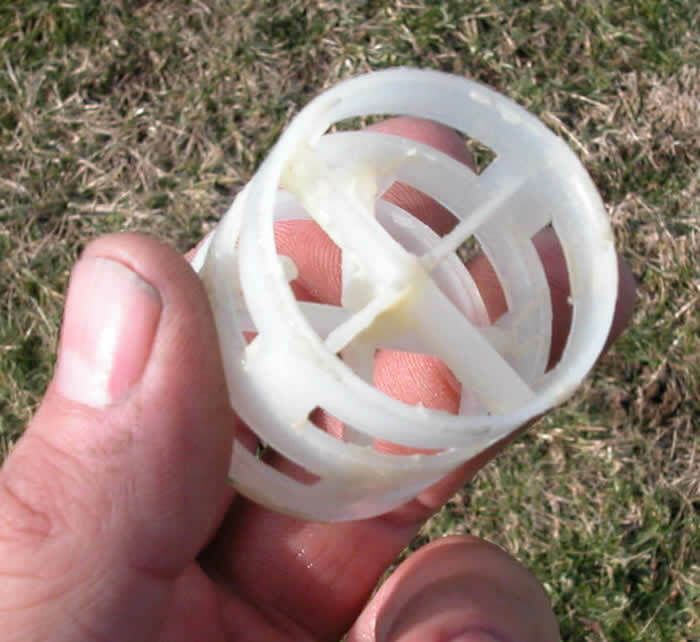 Biorings are small cylindrical plastic structures that allow oxygen to be induced into the low-oxygen ground water. After passing through and being aerated by the biorings, the water is piped underground to a distribution box and sent to the four double upper raceways. After traveling the length of those raceways, the water flows to the lower aerator building where the aeration process is repeated. The water flows through the four double lower raceways, to the broodstock raceway, and then through a sluiceway into the Pequest River. From September to the end of May a portion of the water is sent to the Nursery Building. Here eggs are incubated and newly hatched fry and fingerlings are raised. Most of the water in the nursery is recycled, flowing from the upper aerator to a wall tank that runs along each side of the building and then into individual fry tanks. From the tanks the water is collected and pumped back to the aeration building and out to the raceways. Upper raceways with Well #2 in distance. The water at Pequest must flow continually, twenty-four hours a day, year round, without any interruptions. So what makes this happen reliably and efficiently? Large motorized pumps and...a new flow monitoring control system! 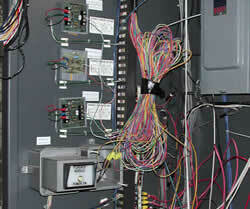 Old wiring in nursery monitor station. 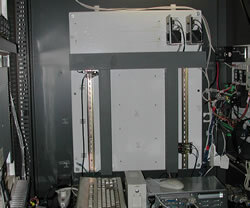 Relay board for telephone system. 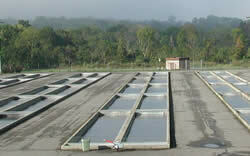 The hatchery's old flow control and monitoring system was divided into two systems. Three well houses were hardwired directly to the Nursery Building, and the other three used touch-tone telemetry technology over telephone lines. 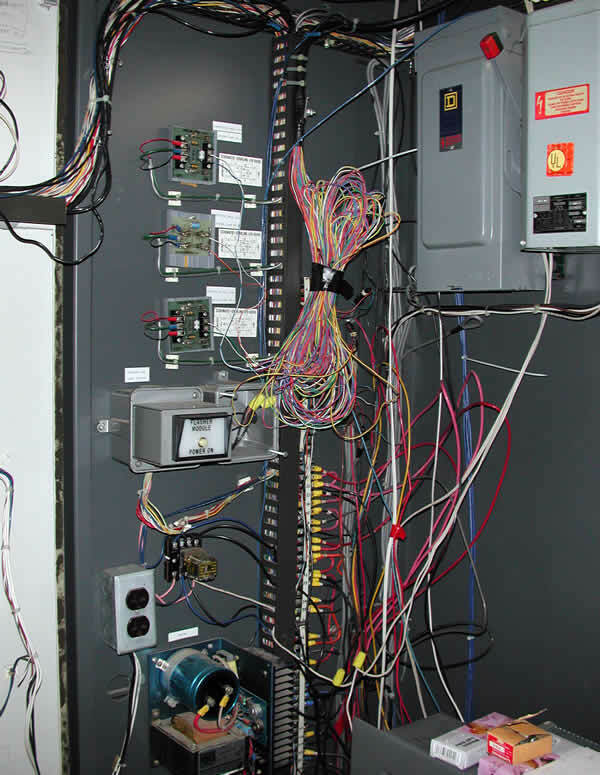 These all connected to an alarm panel in the nursery and were integrated into a system that would monitor all parameters of the system. The three wells that were hardwired (2, 3, and 4) are close enough to the nursery building to be run in conduit underground, but wells 1, 5, and 6 are much farther away - more than a mile in the case of Well 5. At the time of the hatchery's construction tone telemetry was state of the art. It takes a command, converts it into tones and transmits them over a phone line. A receiver hears that tone, recognizes it, and performs the task that was asked of it. This worked well for many years. However, like anything in the technology field it became outdated and obsolete over time. The company that made the equipment went out of business, making repairs or obtaining replacement parts almost impossible. There also was an ongoing concern that if a tree fell on the telephone lines it could take out multiple wells, endangering the hatchery's fish. Although Wells 2, 3, and 4 are hardwired, they are still a distance from the control center (Well 2 is the closest of the group and still over 1000 feet away). This created problems, particularly due to the underground wiring being outdated and vulnerable to moisture. The issue became determining the kind of system which would do the best job. Considerable time was spent investigating alternatives and options. It also included researching the best way to solve problem issues and provide a system that would stand the test of time. The solution is a wireless system using spread spectrum radio technology. This is the same technology the military uses on the battlefield to transmit critical data. There are tremendous benefits, first being the elimination of maintenance on telephone lines or concern over water in the underground wiring system. After some research, Campbell Scientific was contacted because of their specialization in aquaculture facilities all over the world. After a consultation with their representative, project specifications were developed and bids requested. The contract was awarded to BLU DOT INC. and work began in the fall of 2005. The first step was a complete evaluation of the old system. 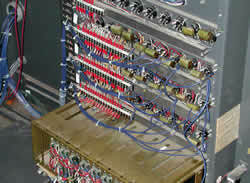 A review of original plans and tracing existing wires was completed. Decisions were made on what was still useful and what had to be removed. 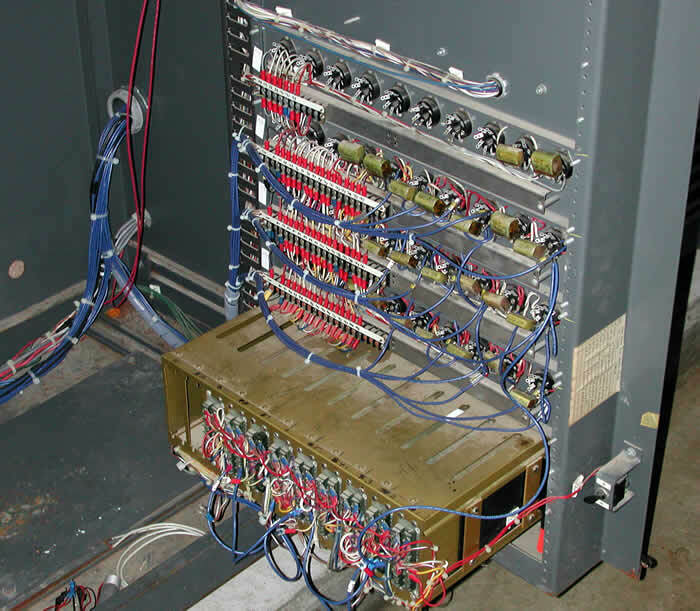 After the old wiring was removed and obsolete components removed from the control panels, the new equipment was installed along side the existing components. 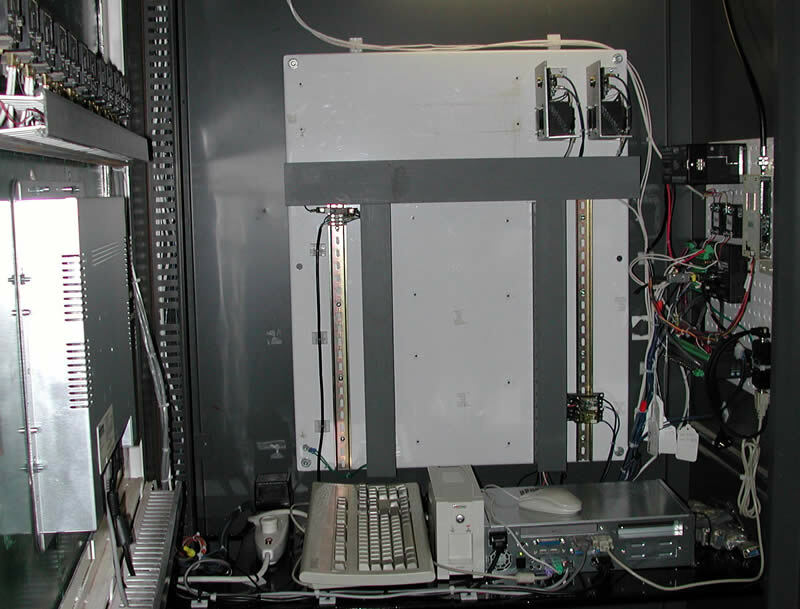 The old system remained partially functional while the installation of the new equipment was being completed. 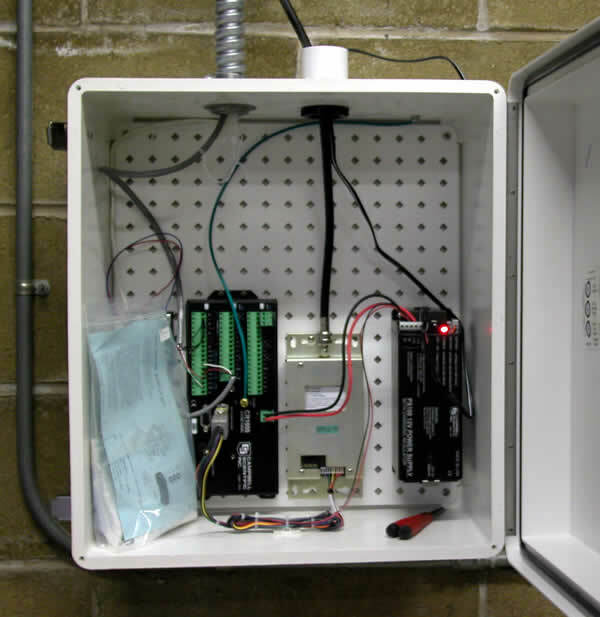 The new system starts with a "spread spectrum" radio and antenna connected to a data logger at each location. The loggers in turn hook up to corresponding devices. 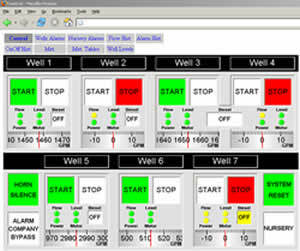 These control each well pump, monitor alarm parameters and show pump run status. 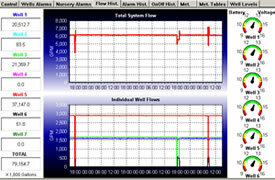 Also hooked up to the data loggers are the flow meters in each well house. The state of backup diesels in well houses 1, 2, and 5 is also monitored. These diesels power the pump in the event of a power failure. Wells 3 and 4 can be operated during a power failure with a backup generator, also monitored by the new system. All data is transmitted back to the Nursery Building where it can be monitored during regular and emergency situations. Computer station in Nursery Building. The Control Screen manages the operation of the electric pump motors. 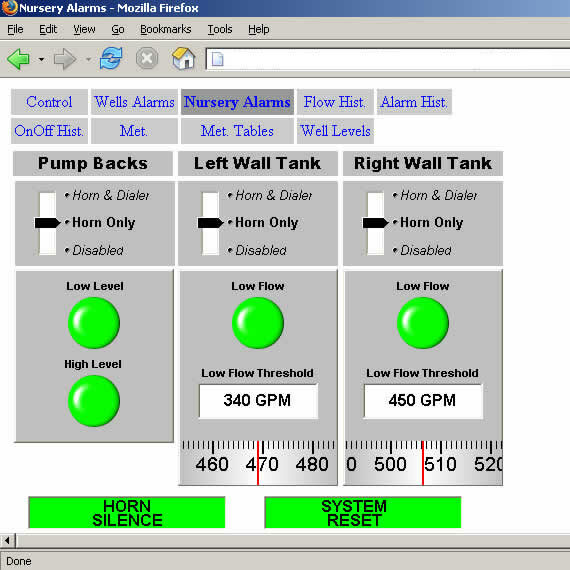 The Well Alarm Screen controls all the enabling and disabling of each alarm parameter. 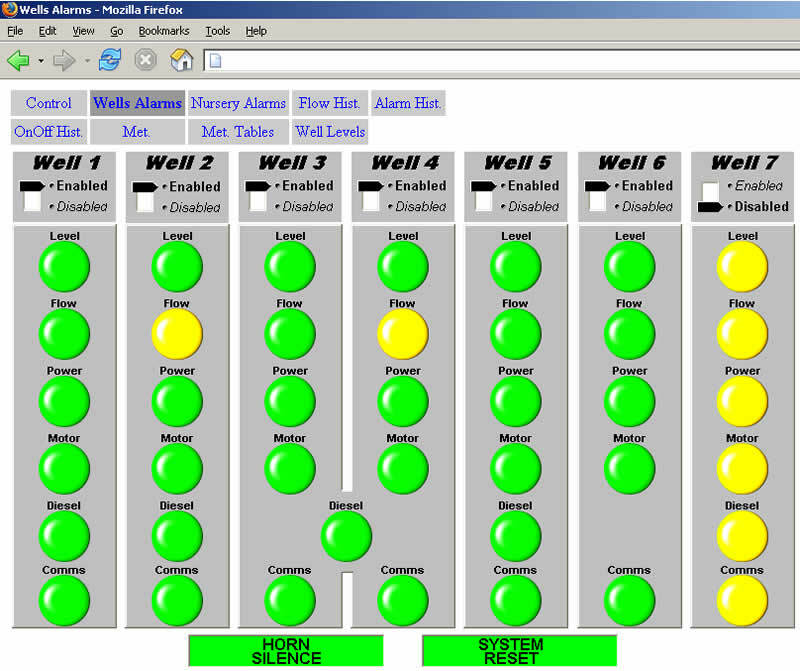 The Nursery Screen displays and controls the status of all nursery water systems (wall tanks, pump backs and incubator flows). 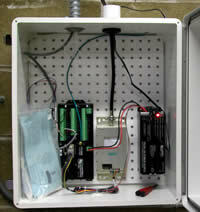 It will also contains the Totalizer, measuring GPM for each well and total hatchery flow. The Alarm History Screen records every event with a time stamp, making troubleshooting any problem much easier than in the past. The Weather Screen displays the current outside conditions. All monitoring is done in the nursery and at two remote computers within the hatchery complex. The system is continuously monitored. Any alarm condition sets off an external siren on the raceways and notifies the alarm monitoring company. Staff is notified and immediately reports to the monitoring stations to evaluate the emergency. This system is PC-based (an industrial computer using Windows XP), unlike our old system, and has been integrated into our local computer network. This is another benefit of this system, allowing us to connect the monitor computer to our network and have the system running on computers in two different buildings. This redundancy within the system allows for control and monitoring in an emergency condition should one of the links in the system fail to work. The radios in the well houses and the one in the nursery (which is the base station) constantly communicate, sending packets of data every few seconds and continually updating information. 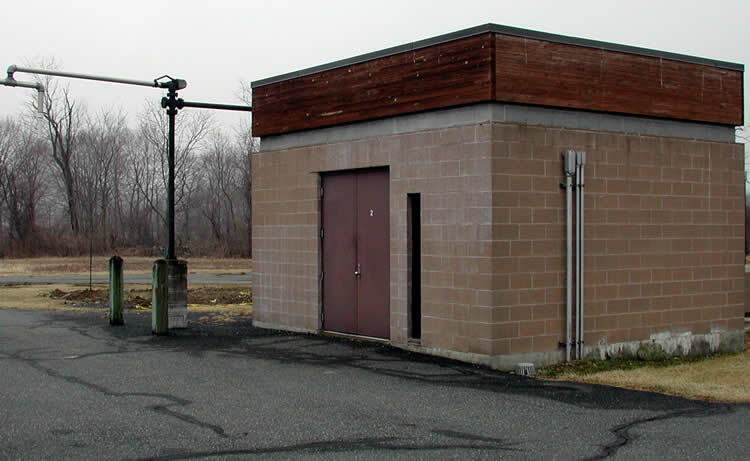 The system also has an alarm should the base station lose contact with one of the satellites for any length of time. Well main control computer screen. 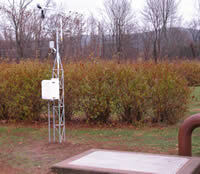 Weather station and Well 3. 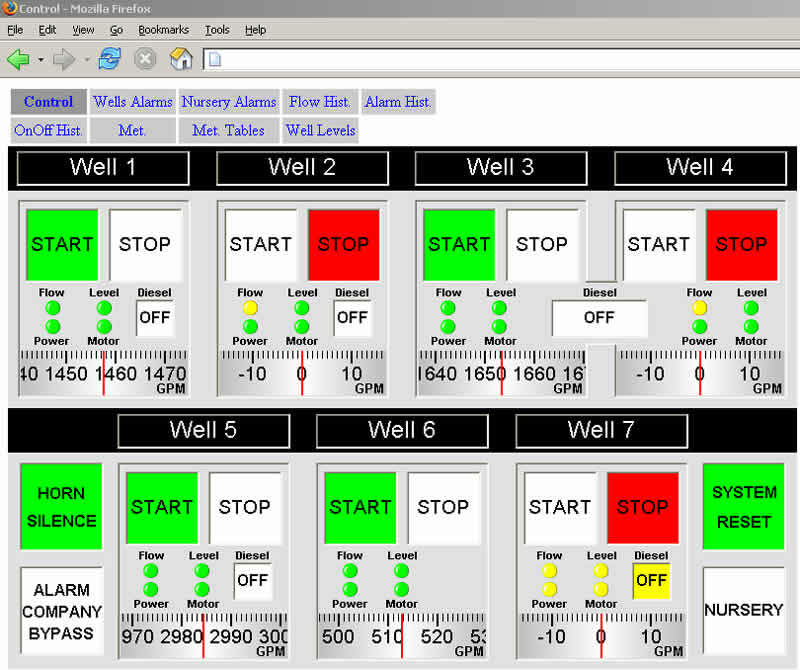 Another benefit of the new system is the solution to a problem in Well 3. Well 3 is in an underground vault in front of the main building. 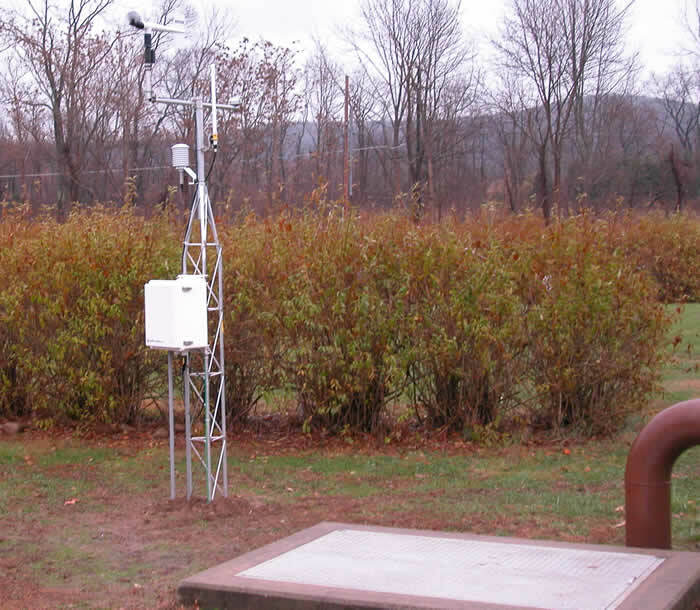 With no place to easily mount an antenna, it was suggested by BLU DOT INC. that a ten-foot meteorological tower, with the transmitting antenna, be installed. Pressure transducer probes have been installed in the wells to monitor and record well water levels. This is invaluable to protect the huge investment in the vertical turbine pumps and motors. Severe damage could occur if water levels are too low in the wells. 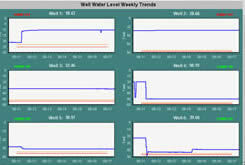 The system sends warning alarms when water levels are getting too low, and adjustments are made to raise the water level in the affected well. If the condition gets too severe, the motor will shut down. Other benefits are that the radios have a very low current draw, meaning they can stand alone for almost thirty hours without line voltage, running off a 12-volt rechargeable battery. Valuable information will not be lost and monitoring will continue during any power outage. Overall, the new system to date has been working without a problem. It also is expandable and can be upgraded on an as-needed basis. When well 7 is completed and comes online it will be very easy to add it to the system. Dealing with a live product - in this case trout - there is no room for mechanical malfunctions. The new flow control and monitoring system has brought the hatchery back to being one of the most modern and efficient trout hatcheries in the nation.